The Princess Festival has some GREAT News! We have been invited to participate in this year's fabulous Winter Palooza event and we would like to invite you and your families! Come play with us, and we'll bring some life into the dead of winter! Don't miss this exciting event! It's a day of play for all of the little princesses (and princes) in your life! The Princess Festival is coming, and all your favorite princesses will be there (plus a few new princess friends). Get your hair styled into a beautiful princess up-do by the students of Paul Mitchell, add some Bling Strands, then take pictures of your Princess, with her favorite princesses. And don’t forget to check out Cinderella’s carriage while you are there! Join us for this fantastic event! Tickets are only $5.00 at the door! Thanks for everything you do to support us and make the Princess Festival possible! 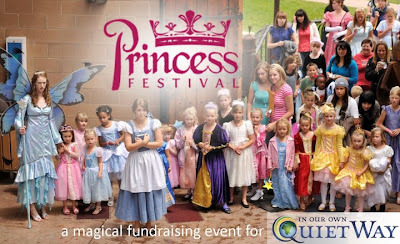 Click HERE for more information on The Princess Festival. Michelle, is this $5 in addition to the cost of entering Winter Palooza? If so what is that cost? Thanks doll! Breanna D.